Shortening of the ﬁrst ray is a potential complication associated with ﬁrst metatarsal procedures. Correction of this deformity conventionally has required the use of a tricortical bone graft to lengthen the bone. Graft complications, including donor site morbidity, poor graft stability, and graft resorption, have revealed a need for an alternative procedure. The present report shows that titanium cage scaffolding has lower extremity applications beyond its previous uses in the ankle and spine. Two patients under- went surgical correction for failed ﬁrst ray procedures using a titanium cage apparatus with a calcaneal autograft and other biologic agents. The scaffolds were appropriately sized to ﬁll the defect. Patients re- mained non-weightbearing until radiographic evidence of healing appeared. Success was determined by diminished pain, a return to activity, ambulation, and patient satisfaction. Patients exhibited faster-than- anticipated healing, including a return to protected weightbearing activities and increased stability within 6 weeks. Titanium cage implants provide long-term stability and resistance to stress and strain in the forefoot. The implant we have described, newly applied to the ﬁrst ray, is analogous to a system used in salvage of failed ankle replacements. In addition to reducing reliance on the iliac crest bone graft, the titanium cage apparatus is advantageous because it is customized to ﬁll a defect using computed to- mography scanning, thereby reducing graft failure secondary to an improper shape. These cases demonstrate the potential beneﬁcial applications for titanium cages in failed ﬁrst ray reconstruction. Failed arthroplasty and other ﬁrst metatarsal procedures fre- quently result in iatrogenic shortening of the ﬁrst metatarsal. These changes in length alter the natural dynamics of the metatarsal parabola, which, in turn, increases the potential for transfer metatarsalgia, lesser metatarsal stress fracture, hammertoe deformity, and collapse of the medial longitudinal arch. First metatarsal arthrodesis has historically been used as a surgical response to revise unsuccessful hallux valgus and Silastic implant arthroplasty procedures. If the metatarsal parabola exhibits shortening of the ﬁrst metatarsal or in- adequate viable bone stock, an arthrodesis procedure will be performed in conjunction with a metatarsophalangeal (MTP) joint distraction and bone graft to restore the ﬁrst metatarsal length. Traditional tech- niques rely on corticocancellous autografts as the grafting material used to lengthen the metatarsal; however, these have associated with donor site morbidity and limited resources. Titanium cage im- plants provide an alternative: a stable, noncompressible construct in which grafts and graft adjuncts with little structural support can thrive. The present study demonstrates how the titanium truss system, pre- viously applied to the ankle, has been successfully used in ﬁrst metatarsal salvage procedures. The use of iliac crest bone graft (ICBG) autografts with MTP joint distraction is currently accepted as the reference standard for a length- ening arthrodesis procedure, but its use comes with a cost. Donor site morbidity at the iliac crest, tibia, or calcaneus contributes to ad- ditional patient discomfort. Goulet et al found that 38% of 87 patients who had received an ICBG experienced donor site pain at 6 months postoperatively and 19% experienced pain 2 years postop- eratively. A comparison of intraoperative morbidities between autografts and allografts showed that patients receiving autografts had a greater than threefold increase in blood loss, lengthened operative time, and chronic pain at the donor site. The likeliness of asso- ciated chronic pain, nearly 1 in 5 after 2 years, and the perioperative disadvantages related to autogenous grafting have necessitated a new avenue for grafting technology that relies less heavily on autogenous grafts. In addition to surgical donor complications, auto- graft resources are limited. Calcaneal grafts, for example, can be a maximum of 2.0 1.0 cm in dimension, and it has generally been accepted that donor morbidity increases greatly with grafts exceed- ing these dimensions. Furthermore, viable bone stock is subject to immense variation in the cellularity of different grafting locations.8 Tibial and calcaneal grafts, for example, contain a greater ratio of qui- escent fat to hematopoietic tissue compared with ICBGs. Therefore, the use of a slightly less invasive harvesting technique, such as in the tibia or calcaneus, will also yield a graft with more feeble osteogenic and osteoinductive qualities (8). Although autografts embody osteogenic, osteoinductive, and osteoconductive qualities, manufactured and allogeneic-harvested graft materials might ultimately yield a more satisﬁed patient because of the reduced donor site discomfort. A combination of synthetic scaf- folds, growth factors, stem cells, and allografts has the potential to yield the positive outcomes of an autograft but with the reduced graft re- sorption and donor site drawbacks. Titanium cage implants supply the necessary structure to support amorphic bio-manufactured graft adjunctive materials or delicate cancellous graft chips, which have all 3 of the obligatory components of bone growth. The inert quali- ties of titanium make its use ideal in a highly inﬂamed region and its strength provides long-term stability and appropriate resistance to stress and strain in a highly used region of the foot. The titanium truss system has only recently been applied to the ﬁrst ray. The system described in the present study is analogous to the titanium cage spacer that has been successfully used in the salvage of failed ankle replacements. According to Mulhern et al, the titanium cage spacer is advantageous because it can be customized to ﬁll a defect using computed tomography (CT) scan- ning. The coarse texture of the titanium cage allows for osteointegration and the ability to 3-dimensionally print a custom scaffold addresses the challenges associated with autografts and allografts, including graft failure secondary to an improper shape . The present report indicates that the titanium scaffold has beneﬁcial applica- tions in the ﬁrst metatarsal after a failed ﬁrst MTP joint Silastic implant and failed ﬁrst metatarsal lengthening procedure with a calcaneal autograft. Fig. 1: Preoperative anteroposterior radiograph of right foot showing subluxed Silastic implant with local osteophytes and heterotrophic bone formation. An active 55-year-old male nonsmoking patient presented with a history of a right foot ﬁrst MTP joint arthroplasty and neuroma ex- cision at his third interspace 6 years previously. His initial physical examination revealed an intact neurovascular status and a drooping right hallux with an inability to dorsiﬂex. The patient had an iatro- genic laceration of the extensor hallucis longus (EHL) at the right ﬁrst MTP joint from the original surgery. This was conﬁrmed by ultra- sound imaging. Passive range of motion at the right ﬁrst MTP joint was severely limited and revealed notable crepitus. The patient had an antalgic gait with circumduction on the right side. Radiographs and CT imaging (Figs. 1-3) revealed a subluxed Silastic implant with local osteophytes and heterotrophic bone formation. The distal end of the implant abutted the proximal medial cortex of the right proximal hallux with clear signs of cortical erosion in that area. Ultrasound studies showed a 6-cm diastasis between the EHL tendon stumps extending from the ﬁrst metatarsal cuneiform to the ﬁrst MTP joint. The com- bination of the patient's EHL tendon laceration, dysfunction of the ﬁrst MTP joint, and bony erosion at the ﬁrst MTP joint, indicated an ar- throdesis with an EHL tendon repair. Before surgical treatment, the patient attempted nonoperative care, including stiff-soled shoes and orthotics, without success. Eight months after his ﬁrst appointment, he underwent preoperative CT scans, which conﬁrmed subluxation of the Silastic implant and local osteolysis. AnBefore surgical treatment, the patient attempted nonoperative care, including stiff-soled shoes and orthotics, without success. Eight months after his ﬁrst appointment, he underwent preoperative CT scans, which conﬁrmed subluxation of the Silastic implant and local osteolysis. An autograft, including demineralized bone matrix, was indicated to perform this arthrodesis because of the extensive bone loss incurred by the failed implant. The use of a cage implant was discussed, and the patient ultimately consented to its use, given the potential beneﬁts. In the operating room, the patient was placed in a supine posi- tion under general anesthesia with the use of a thigh tourniquet at 250 mm Hg. A 7-cm incision was made dorsomedially over the ﬁrst MTP joint to reveal both the implant and the ruptured EHL tendon. The implant appeared to be protruding out of the dorsal aspect of the ﬁrst metatarsal with associated bone fracturing, reactive tissue, and debris. The debris and implant were removed using a rongeur, curette, and rasp and then ﬂushed with copious plain saline. Additionally, the EHL tendon showed signiﬁcant fraying and substantial ﬁbrous reconstitution and was freed to return to its proper positioning. Fig. 2: Preoperative lateral radiograph of right foot showing subluxed Silastic implant with local osteophytes and heterotrophic bone formation. An autologous bone graft was harvested using a punch graft from the lateral wall of the right distal tibia and right lateral calcaneus under the guidance of ﬂuoroscopy. The graft included cortical and cancel- lous bone, and the defects were ﬁlled with demineralized bone matrix bone putty. Next, the ablated joint space was assessed for size and shape using the sizer speciﬁc to the titanium implant. Before placing the 6-mm cage into the arthrodesis site, it was packed with the au- tologous bone graft and the demineralized bone matrix containing growth factors. After placing the cage, a spanning plate with was fastened over the base of the proximal phalanx to the ﬁrst meta- tarsal using 3.0-mm locking and nonlocking screws. A second 6-hole plate was placed medially over the same region using six 2.4-mm nonlocking screws to prevent any motion at the cage-graft site. Intraoperative ﬂuoroscopy conﬁrmed appropriate placement of the titanium truss and plate construct at the right ﬁrst MTP joint. The goal of the additional plate was to increase the stability and prevent frontal plane rotation of the cage construct. After closing, a well-padded splint was placed on the patient for postoperative immobilization. Fig. 3: Preoperative sagittal computed tomography of right foot showing subluxed Silastic implant with local osteophytes and heterotrophic bone formation. The patient endured 6 weeks of non-weightbearing in a cast, pos- terior splint, and, ultimately, a controlled ankle motion walker boot. The patient also began using a low-intensity pulsed ultrasound bone stimulator at 2 weeks postoperatively. By 6 weeks postoperatively, the patient had noted a drastic decrease in pain, and he was ready to bear weight protected in a controlled ankle motion walker boot. Radiographs and a CT scan at 2 months postoperatively showed bony fusion between the distal aspect of the right ﬁrst MTP joint and the titanium cage implant without signs of bony resorption. At 9 months postoperatively, the patient exhibited bony fusion and had returned to work wearing regular shoe gear. The treatment dates included surgery in August 2016 and 10 months of follow-up examinations through May 2017. Fig. 12: Preoperative anteroposterior radiograph of the right foot confirming nonunion with bony resorption at the autograft implantation site. A nonsmoking 57-year-old female presented with a complicated right foot deformity, including a history of 2 previous distal bunion procedures and second and third interspace neurectomies. The pre- vious bunionectomies had resulted in a short ﬁrst ray with an abnormal parabola and an elongated second ray. Additionally, the patient ex- perienced pain in her second metatarsal, which was later shown radiographically to have a signiﬁcant stress fracture. The physical ex- amination revealed an intact neurovascular status. The patient underwent a right foot revision bunion procedure with lapidus and interpositional calcaneal bicortical graft, along with a second meta- tarsal shortening osteotomy. The patient's graft resorbed, which resulted in nonunion of the right ﬁrst tarsometatarsal joint. It was later determined that the patient had a vitamin D deﬁciency, which likely contributed to the nonunion. Preoperative radiographs and CT imaging conﬁrmed nonunion with bony resorption at autograft implantation site (Figs. 12-13). At 7 months after her diagnosed nonunion lapidus procedure and correction of her vitamin D deﬁciency, a titanium cage implant with stem cell allograft and a medial column fusion plate was determined to be the most effective option for surgical revision. In the operating room, the patient was placed in the supine po- sition under general anesthesia with the use of an ankle tourniquet. A linear incision was made over the preexisting scar in the right foot. Internal ﬁxation was removed at the ﬁrst tarsometatarsal joint. The nonunion was identiﬁed and debrided to healthy bleeding cancel- lous surfaces, resulting in an 8-mm defect, determined using a sizer speciﬁc to the implant. An 8-mm titanium mesh cage implant was then loaded with stem cell allograft and placed and then tamped into po- sition, with the foot held in the neutral position. A medial column fusion plate was placed over the titanium cage with screws purchasing viable bone on both sides. The naviculocuneiform joint was ﬁxated for ad- ditional stability, which was necessary to achieve the ﬁxation construct. The naviculocuneiform joint was added to achieve a superconstruct. Stabilizing 1 joint proximally offered more stability in her previ- ously compromised fusion. The proximal locking screws could be removed later for additional motion. After closing, a well-padded splint was placed on the patient for postoperative immobilization. Fig. 15 shows the immediate postoperative cage implant placement with medial column plate ﬁxation. Fig. 13; Preoperative sagittal computed tomography scan of the right foot confirming nonunion with bony resorption at the autograft implantation site. The patient remained non-weightbearing with crutches for 2 months. After 2 months non-weightbearing, the radiographs and CT scans conﬁrmed bony union, and the patient was transitioned to weightbearing in normal shoe gear. At 3 months post- operatively, the patient sustained a right calcaneal avulsion secondary to trauma at a previous calcaneal graft site requiring open reduction and internal ﬁxation. At 11 months postoperatively, the patient re- turned to work ambulating in regular shoe gear, having recovered from the calcaneal graft complications related to the original failed ﬁrst ray procedure. The treatment dates included surgery in May 2016 and 1 year of follow-up through May 2017. Although ﬁrst ray procedures are common, the resulting nonunions or excessive shortening have made these procedures diﬃcult to correct. Bone grafting with fusion is the current standard of care to repair a nonunion with excessive shortening (15). To have optimal function- ality, a graft must have mechanical stability. Graft stability is diﬃcult to achieve, especially with trephine autogenous grafts and osteobiologic agents, because they lack strong cortical surfaces. Access to tricortical autogenous grafts is limited and postoperative morbidity is not uncommon; therefore, alternative methods to create stability in a weightbearing region are necessary (19). The cage implant's strength and high coeﬃcient of friction create a stable construct even before both sides of the grafting system have fused, unlike a tradi- tional cortical graft. Its design allows for great strength that is minimally heavy or bulky and also creates an ideal lattice for bony ingrowth . Moreover, the titanium cage spacer is able to absorb and distribute the weight forces as soon as the bone has healed. In contrast, autogenous grafts can resorb and disintegrate before fusion has occurred at the site of arthrodesis (19). The titanium cage main- tains the structure as osteoclastic activity slowly dissolves the graft components. Our cases explored a unique application of the tita- nium cage at weightbearing joints of the ﬁrst ray as a mechanical stabilizer and as a housing system for structureless grafts. The future of osseous grafting is in 3-dimensional (3D) printing. Although the present study used sizers with prefabricated titanium cages, the technology to create fully customizable implants has many applications. The indications for 3D printing include segmental defect replacement, joint arthrodesis, void ﬁlling, and, eventually, total bone replacement (20). Tetsworth et al detailed the uses of 3D-printed custom titanium cages with extensive femoral shaft defect substitu- tion. They recommended the addition of plates for metaphyseal and juxtaarticular applications, intramedullary nails for diaphyseal appli- cations, and screws or cerclage wires to further stabilize the construct (20). Additionally, they reported that cages create a secure environ- ment through which bony growth can occur. Moreover, the rutted surface promotes the cage's osteointegration (20). In the context of arthrodesis, Mulhern et al (17) reported success using custom trusses in their conversion of a failed total ankle reconstruction to an ankle arthrodesis. At a 30-week follow-up examination, their patient main- tained anatomic alignment, demonstrated joint stability, and was fully weightbearing and pain free in a regular shoe (17). Their case report indicates that customizable cage implants could play an important role in complex revisional arthrodesis (17). The cases described in the present report drew from both titanium cage applications as a seg- mental defect ﬁller and as a tool for stable arthrodesis, as well as a novel lengthening device. Although the titanium cage spacer has the capacity to lengthen the ﬁrst ray quite drastically, it is limited in use with contracted and scarred local soft tissue. Caution must be taken when lengthening a ray dras- tically in a single-step procedure because of the danger of neurovascular embarrassment and digital deformities secondary to a restricted tendon length (21,22). The present study found that in both cases, subopti- mal lengthening was achieved because of soft tissue limitations. Regardless, a functionally acceptable metatarsal parabola was accom- plished in both patients, who had previously experienced severe ﬁrst ray length deﬁcits. During the follow-up period, neither patient ex- perienced second metatarsal transfer pain and both had normal mechanical ambulation. The present study had a few procedural ﬂaws. It lacked substan- tial patient volume, long-term patient follow-up ( 1 year), and used poorly substantiated guidelines for determining procedural success. The present study was retrospective, and we were responsible for in- terpretation of the clinical outcomes; therefore, bias was possible. Failed ﬁrst ray procedures present a plethora of revisional chal- lenges. The joints of repair are orthogonal to the weightbearing forces, which compounds the diﬃculty of achieving bony union. Titanium cages are mechanically strong, stable, and allow for osseous integra- tion. Furthermore, they are lightweight and highly customizable, which make them ideal for grafting in the smaller joints of the foot. This tech- nology could permit surgeons to rely less heavily on the ICBG and avoid unnecessary donor site morbidities, especially in patients with poor bone stock. It is not a ﬁrst-line treatment and does not replace stan- dard fusion; however, it does demonstrate an innovative approach to complex revisional surgery. In conclusion, although the present study had a limited patient volume, the success in the form of ﬁrst ray mechanical stability, ra- diographic union, and patient satisfaction should be considered. Larger scale studies with long-term follow-up are needed to conﬁrm our results. 1. Gross CE, Hsu AR, Lin J, Holmes GB, Lee S. Revision MTP arthrodesis for failed MTP arthroplasty. Foot Ankle Spec 6:471-478, 2013. 2. Winters BS, Boleslaw C, Raikin SM. Metatarsophalangeal fusion techniques with ﬁrst metatarsal bone loss/defects. Foot Ankle Clin North Am 20:471-491, 2015. 3. Brodsky JW, Ptaszek AJ, Morris SG. Salvage of ﬁrst MTP arthrodesis utilizing ICBG: clinical evaluation and outcome. Foot Ankle Int 21:290-296, 2000. 4. Greisberg J. The failed ﬁrst metatarsophalangeal joint implant arthroplasty. Foot Ankle Clin North Am 19:343-348, 2014. 5. Hecht PJ, Gibbons MJ, Wapner KL. Arthrodesis of ﬁrst metatarsophalangeal joint to salvage silicone implant arthroplasty. Foot Ankle Int 18:383-390, 1997. 6. McAlister JE, Hyer CF, Black TE. Distraction ﬁrst metatarsophalangeal arthrodesis with tricortical calcaneus autograft. Foot Ankle Spec 20:1-5, 2016. 7. Myerson MS, Schon LC, McGuigan FX, Oznur A. Result of arthrodesis of the hallux metatarsophalangeal joint using bone graft restoration of length. Foot Ankle Int 21:297-306, 2000. 8. Miller CH, Chiodo CH. Autologous bone graft in foot and ankle surgery. Foot Ankle Clin 21:825-837, 2016. 9. Ehrler DM, Vaccaro AR. What should be the characteristics of the ideal bone graft substitute? Combining scaffolds with growth factors and/or stem cells. Clin Orthop Relat Res 371:38-45, 2000. 10. Goulet JA, Senunas LE, DeSilva GL, Greenﬁeld ML. Autogenous iliac crest bone graft: complications and functional assessment. Clin Orthop Relat Res 339:76-81, 1997. 11. Michelson JD, Curl LA. Use of demineralized bone matrix in hindfoot arthrodesis. Clin Orthop Relat Res 203-208, 1996. 12. Oryan A, Alidadi S, Moshiri A, Maffulli N. Bone regenerative medicine: classic options, novel strategies, and future directions. J Orthop Surg Res 9:18, 2014. 13. Cass AN. Calcaneal autografts: indications, technique, and complications. Podiatry Inst 34:172-177, 2014. 14. Hansen ST. Miscellaneous techniques. In: Functional Reconstruction of the Foot and Ankle, pp. 492-493, Lippincott Williams & Wilkins, Philadelphia, 2000. 15. Fitzgibbons TC, Hawks MA, McMullen ST, Inda DJ. Bone grafting in surgery about the foot and ankle: indications and techniques. J Am Acad Orthop Surg 19:112-120, 2011. 16. Khandaker M. Plasma nitriding of titanium alloy: effect of roughness, hardness, biocompatibility, and bonding with bone cement. Biomed Mater Eng 27:461-474, 2016. 17. Mulhern JL, Protzman NM, White AM, Brigido SA. Salvage of failed total ankle replacement using a custom titanium truss. J Foot Ankle Surg 55:868-873, 2016. 18. Hamid KS, Parekh SG, Adams SB. Salvage of severe foot and ankle trauma with a 3D printed scaffold. Foot Ankle Int 37:433-439, 2016. 19. Sagherian BH, Claridge RJ. Porous tantalum as a structural graft in foot and ankle surgery. Foot Ankle Int 33:179-189, 2012. 20. Tetsworth K, Block S, Glatt V. Putting 3D modelling and 3D printing into practice: virtual surgery and preoperative planning to reconstruct complex post-traumatic skeletal deformities and defects. SICOT J 3:16, 2017. 21. Jones MD, Pinegar DM, Rincker SA. Callus distraction versus single-stage lengthening with bone graft for treatment of brachymetatarsia: a systematic review. 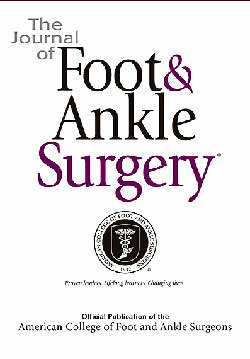 J Foot Ankle Surg 54:927-931, 2015. 22. Paley D. Problems, obstacles, and complications of limb lengthening by the Ilizarov technique. Clin Orthop Relat Res 250:81-104, 1990.